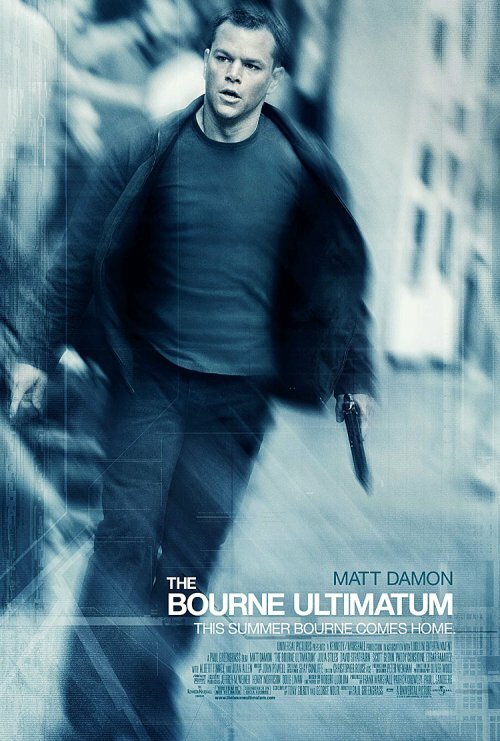 Via Cinematical we have the brand new poster for The Bourne Ultimatum. Honestly, this poster feels like a bit of a retread. It’s basically the same Bourne walking around with a gun poster we got from the first and second movie, but now in a blue tone. I much prefer the earlier posters for Ultimatum, which gave the third film a more distinctive look. I think I love this poster. What makes it stand out for me is that it doesn’t try too hard to call your attention. There is a lot of white space. The colors are mostly muted and washed out, with the exception of a little dash of pink. And the (very big) actors only occupy a small portion of the image, are not facing you and, in the case of Jack Black, are even a little out of focus. All of these amounts to a very clean, very classy image. Of course, this wouldn’t be a good poster for a summer blockbuster. But it’s important to now your audience and cater to it. The movie is probably gonna be most interesting for people who like serious, even if still very funny, relationship dramas. And I think the poster is going to speak to these people. It’s going to say that this is a smart, subtle movie, with big stars who are looking to give a solid performance and not to show off. And I think the intended audience will find this very appealing. This is one of my favorite movie posters so far this year. I guess sometimes less really is more. It’s funny how we associate certain images with an idea. For me an image of a beat down bus is intrinsically associated with a white guy going into a journey of self discovery in some foreign country. Probably one in Africa. I guess I got that from countless movies which follow that premise and feature a scene of the character coming to contact with the local culture by taking a trip in an old bus. Perhaps because of that association I think this poster does a great job of telling us about the movie’s premise. In this case the character is taking a trip to Alaska, not to Africa, but I think it still works. The title is probably enough to clear any lingering doubts. 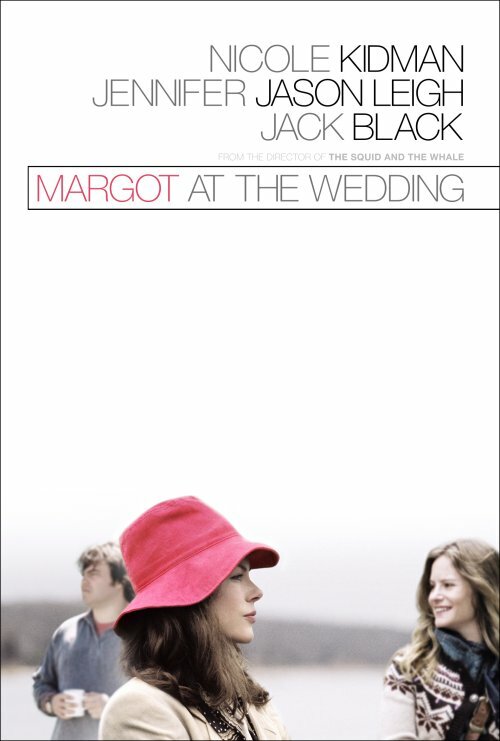 Beyond that, it’s a good looking and charming poster for what will hopefully be a worthwhile film. 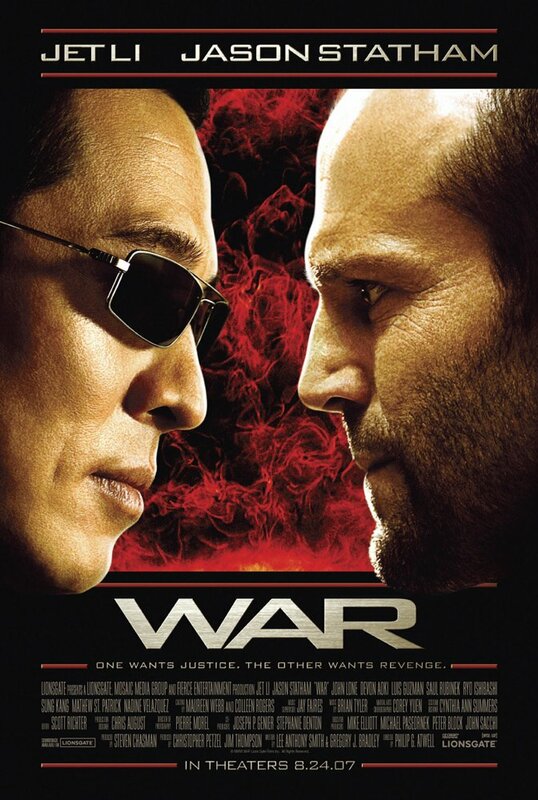 The new WAR poster follows the same basic concept of the first poster: Jet Li and Jason Statham starring at each other. Like I said before, not a a particularly creative concept, but it’s probably right for this movie. There are a few key differences between this and the first poster: the new poster uses the more typical portrait orientation instead of the landscape orientation used in the first one, Jet Li now is wearing sunglasses, and the background has been changed from a city to a red fire thingy. Beyond that, the new poster also uses a darker color scheme, with a lot of black and some very vivid reds. I don’t like the sunglasses or the background. I think that the image looks significantly more intense when we get to see Li’s eyes. The sunglasses make him seem too cool, like he doesn’t really care about any of this and is not at all worried about Statham. The background is a quite cheesy. I mean, red fire? Really? The original city background didn’t call attention to itself, but it was nice and not too cliched choice. I do like the new colors tough. They make the poster stand out more and give it a crisp, strong look. But I still like the first poster more. 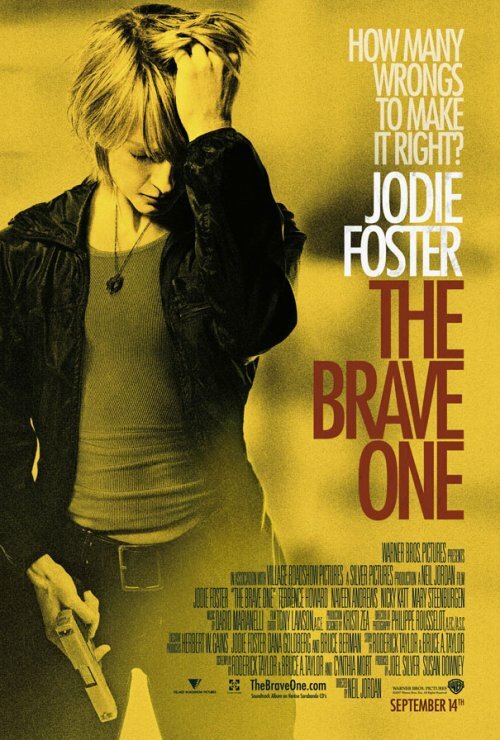 Via thehotblog (and many other places) we have the new poster for Neil Jordan’s The Brave One, starring the one an only Jodie Foster. That team right there is enough to get me excited about this movie. I like the poster, but don’t love it. The image of Jodie Foster looking distraught and holding a gun is great, and it harkens back to the movie’s story, which has Foster’s character acting as a vigilante after her fiancee gets killed. I also like how the poster’s text is aligned to the right, allowing the image of Foster to fill the left side mostly by itself. And the tagline isn’t terribly original, but it’s solid. But the whole yellow and grainy look isn’t doing it for me. I guess it’s supposed to give the poster a more gritty and real look, but it mostly reminds me of the opening of Law and Order. I think it makes the poster look a little duller than it has too, and it softens the emotional impact that the image of Foster would have otherwise. The Brave One opens September 14th. Live Free or Die Hard opens tomorrow. So, to get you people on the right mood, here is a look at the posters for this series so far. Remember when Bruce Willis had hair?